John Belz shares his experiences learning to fly a taildragger as he transitioned from flying a Piper Cherokee to flying a Cessna 185. The process of learning to fly a taildragger requires patience and persistence. When my instructor Matt recently endorsed my logbook for high performance and tailwheel aircraft, he said that I should think of his signoff as an endorsement to keep learning on my own, and not the end of the process. I liked that. 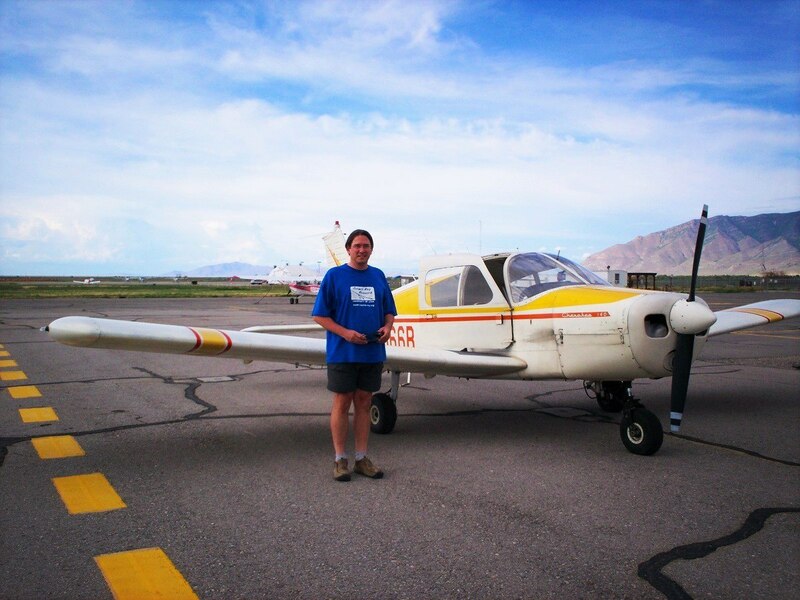 It is in the spirit of continuing to learn and encouraging others to do the same that I have written this article about my experiences learning to fly a taildragger as I transitioned from flying a Piper Cherokee to flying a Cessna 185. Some background: I learned to fly in a Piper Cherokee 140/150 in 2009. My interest in flying was and is recreation. I want to see the world from a new perspective, to play with interesting gadgets, and to challenge myself. I accumulated about 350 hours in the next five years, all in the Cherokee. Just before my first solo in the Cherokee, June 2009. While I never had a flight I didn’t enjoy, I started to itch for new challenges. As I was starting to investigate different types of aircraft, the Cherokee nudged me along by badly flunking an annual inspection. Canyoneering in a Cherokee. “Hershey Bar” wing in foreground. 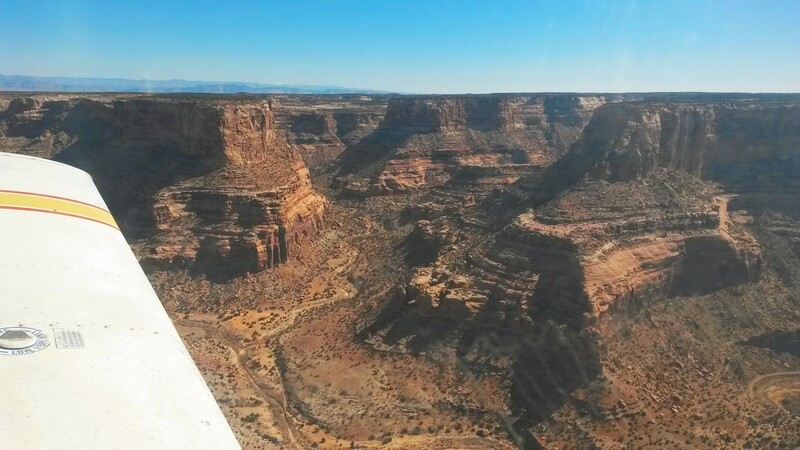 I had been flying over some of the otherworldly landscapes of Southern Utah, and was interested in something in which I could further explore the backcountry. Also, I wanted something that would be practical for taking my wife and stepdaughter to farther destinations. Just in time for me to call it a fiftieth birthday present to myself, I brought home a Cessna 185 Skywagon. I’m not just gratuitously throwing my age into this article: The brain learns differently at different stages of life. Children and young adults have more mental flexibility, while older people can draw on a wider range of experiences to help them learn. So I think my age is relevant in understanding my tricycle-to-taildragger transition. And also why things that helped or hindered my progress might be different from those of someone else. One way in which I think experience helped me was in knowing that I could succeed in flying this new airplane. There were times I was frustrated with my slow progress (or even regress). But I never really doubted that I would eventually succeed. I’ve been in situations before where I felt overwhelmed by challenges, and I know that with patience and persistence I will overcome them. Another learning tool developed through experience is the technique of breaking a complex task into its most basic, simple components. In transitioning from Cherokee to Skywagon, I was dealing with, at the same time, learning to handle a high-performance engine, a complex propeller, and tailwheel landing gear. Some people suggested, and I considered, that perhaps I start by learning to handle a smaller taildragger first. But in the end, I jumped straight into the 185. 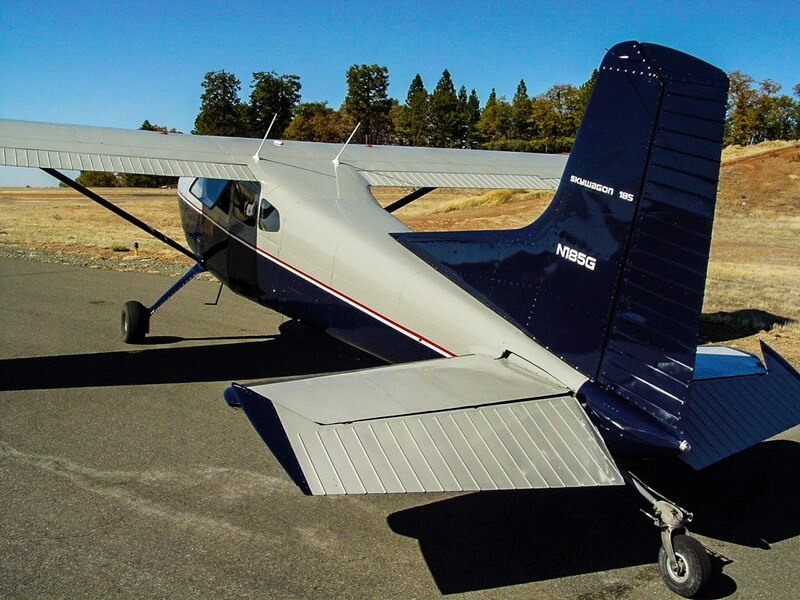 It turns out that, for the most part, all the high-performance aspects of flying are managed in the air, while the challenge in handling a taildragger occurs on the ground and in putting the plane on the ground. So in the end, I don’t feel that learning high performance and tailwheel at the same time was significantly more difficult than learning both on their own. Early on in my training, my instructors (I was fortunate to have two seasoned Cessna 185 pilots working with me) started urging me to plan ahead, so that the aircraft speed and configuration were what I needed them to be well in advance of performing a particular maneuver. Consider work in the traffic pattern with both planes. In the Cherokee, it would be a good day when the plane reached pattern altitude by the time I was abeam the numbers in the downwind leg. But in the Skywagon, with a little inattention, I could easily blow through pattern altitude and flaps-down speed if I didn’t start inching the throttle back once I was well off the ground. Similarly, in a high-performance aircraft, one cannot just cut the power abruptly to transition from cruise configuration to descent for a landing. It was just a matter of repetition, and patience on the part of my instructors, until thinking two steps ahead became habitual. My Cessna 185 Skywagon: A big step up from a Cherokee. I personally felt that dealing with the handling of a taildragger on takeoff and (especially) landing was a much bigger challenge. It took me much longer to master those skills. I think that a big reason was that it is hard to break down a taildragger landing into basic components. Everything happens at once. Final approach is much the same in a tricycle or taildragger. You keep the numbers “fixed” in your view by managing power, pitch and ailerons. You do have to think about the rudder (“feet alive”, I still hear my instructor’s voice telling me on final) because the tailwheel aircraft must be pointed in the direction it is traveling when it hits the ground. But once the runway threshold is crossed a rapid sequence of maneuvers needs to occur in the right order and at the right pace, all the while keeping feet alive. You might spend several minutes per cycle in the traffic pattern, but the most critical aspects of the landing occur in a few brief seconds. been completed. I was stuck in this state for several lessons. Eventually, my instructor Jim had the idea that I focus only on the rudder while he handled the yoke and throttle. This proved to be a breakthrough. By doing a dozen or so landings while restricting my attention to my feet, I developed a feeling for keeping my feet alive until the plane came to rest. As that habit became ingrained, I was able to add the other controls without neglecting the rudder. There was one final detail which proved important. When landing a taildragger (or taking off or taxiing, for that matter) it is essential that the pilot be very sensitive to small changes in the direction the plane is pointing. As I said before, it is critical that the plane point in the direction of its velocity while on the ground. And one must be ready to quickly correct any small deviations. “Punch and jab” is a phrase commonly used to to describe the foot motions necessary to maintain directional control with the rudder. The detail which was key for me dealt with this question: Where should one’s eyes be focused in order to have proper sensitivity to the aircraft’s pointing direction? Certainly not in the cockpit. You are looking for information about the relationship between the plane and ground, and you need to look outside for that. The runway centerline is not really what you want to focus on either. The plane could be moving parallel to the centerline but be crabbed left or right, a recipe for a ground loop. You need to establish a view which enables you to sense the plane, centerline, and distant horizon at the same time using your peripheral vision. Some like to focus on the end of the runway, but what seemed to work best for me was the “eyes in the sky” technique suggested by Matt. I would focus on a patch of sky maybe 5 degrees (a fist’s width at arm’s length) above the horizon. This way, all of the information about the plane’s motion was coming to me from my peripheral vision. This way, I avoided getting fixated on a particular item in my direct view. Once I’d gotten the hang of “feet alive” and monitoring the plane’s motion with my peripheral vision, things started to come together pretty quickly. And they were fine-tuned with practice. Wheel landings and cross-wind wheel landings were a matter of patience. I was not trying to force the plane down but letting it settle to the ground on its own. Landing on grass or gravel was a straightforward, though exciting, extension of the same techniques. I’d like to thank both of the CFI’s who worked with my on my endorsement, each of whom contributed to my motivation to write this article. Jim thought it might be of interest to other pilots who are working their way up the chain, as well as something I might be interested in reading myself years from now. Matt encouraged me to keep learning, and I have kept this encouragement in mind as I’ve begun to operate the 185 as pilot in command.